Harold White, 55, of Albany, drown Saturday a little before 5 p.m. in a cove close to Wisdom Dock on Dale Hollow Lake. According to the Kevin Kelly, Public Affairs Liaison for the Kentucky Department of Fish and Wildlife, there were multiple eyewitness accounts that said White was swimming close to his rental pontoon when he started struggling to stay afloat. Once White went under, he never resurfaced according to Kelly. Kelly said Kentucky State Police officers from Post 15 Columbia, as well as the Clinton County Sheriff’s Department were on hand to assist in the investigation. 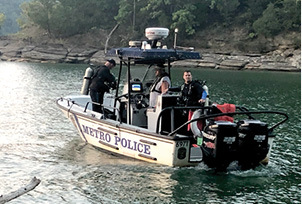 Also on the scene was the Louisville-Metro Dive Team who were already on Dale Hollow Lake doing training exercises on Trooper Island last weekend. According to KSP Officer Jason Warinner, White’s body was recovered by the dive team around 7 p.m. Saturday night. The investigation is still on going by the Kentucky Department of Fish and Wildlife. This team of divers from the Louisville Metro Police Dive Team recovered the body of Harold White near Wisdom Dock Saturday. The team was conducting training exercises when they were called to the scene.